If you're about to do that last-minute scramble to find a house to rent this summer on Cape Cod, there's no rush. With home sales in decline, owners of Cape Cod vacation properties are more anxious than ever to rent them for income to cover big mortgage payments or home equity loans. There is so much availability that rental agents and homeowners are jockeying to attract latecomers looking for rentals in July and even into August, the most popular month for vacationers. "There are too many homes on the rental market," said Mary Fritz, a rental agent for Wilkinson & Associates in Orleans. "You can get a deal. People are negotiating." One of her clients knocked $1,000 off the $5,000 weekly rate for a four-bedroom house on Pleasant Bay in South Orleans. Even now a three-bedroom in Eastham -- minutes from Nauset Light Beach -- is unrented for five weeks in July and August, at $1,400 a week, the same price as last year. Another three-bedroom, on Main Street in East Orleans, has four prime weeks available at $1,600. Its best selling point may not be price, but a rare amenity: The owner allows pets. Comprehensive data on the Cape rental market are not available. However, popular websites, such as vrbo.com -- for "vacation rentals by owner"-- has many listings with multiple weeks still available. And on HomeAway.com , the number of owner-listed Cape Cod rental properties jumped 66 percent this year, to 3,068 from 1,841 last summer, said spokeswoman Eileen Buesing. 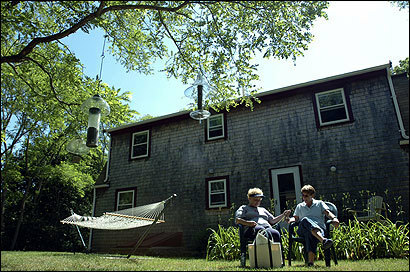 Nancei Radicchi and Barbara Hubley, the owners of that Eastham house near Nauset Light Beach, have been unable to rent five of the nine summer weeks they make it available. Hubley, who spent last weekend at the house with her mother, sees evidence of the sluggish rental market every time she drives around the neighborhood. "I've noticed a lot more signs on the property that say summer rental," she said. She suspects that homeowners are advertising rentals themselves rather than hiring a broker, to save on the commission fee. Their rental agent, Fritz, said she's surprised their home hasn't rented, because the weekly rate -- $1,400 -- is "very reasonable" for the well-maintained three-bedroom, two-bath house with an additional shower outdoors. The house is close to Coast Guard Beach, and has a new deck and redone floors. "They've done a nice job fixing it up," she said. Property owners are wrestling with several phenomena these days. Investors who snatched up vacation homes at record prices during the recent housing boom are now finding their properties are worth less, making it impossible to sell for a profit. That's left many owners desperate to rent to meet the mortgage. A second issue is a more finicky rental crowd that wants more amenities in getaway homes. A younger generation of vacationers, brokers said, demand central air conditioning and Internet access at rentals, when their parents' generation was content with a backyard hammock and the summer breezes. Fritz said owners are "financially squeezed" by bargain-hunting renters at one end and "by higher mortgage payments and fuel costs" at the other. To compete for these renters, some longtime homeowners financed renovations with home equity loans, said Bett McCarthy, a regional vice president for Kinlin Grover GMAC Real Estate, one of the largest rental agencies on Cape Cod, with 15 offices. "If you drive around here, you'll see incredible renovation, so a lot of people sunk that money back into the property," she said. "Now maybe their house is worth $600,000 instead of $500,000, but their mortgage is considerably higher, too. They need to rent these properties in order to meet their expenses." And the Internet has also vested renters with more bargaining power by giving them a larger number of properties to browse, and making it quick and easy to continue searching, screen after screen, houses with pictures, dates, and even the owner's cellphone number. Suzie and Dan Schwebach used to have no problem booking up their Orleans home via vbro.com as early as January of each year; as of last week, they still had one week open, at the same rate as last year -- $1,800. "Part of the reason for that is, I think, there are so many houses on the Internet," Suzie Schwebach said. One matter that apparently is not a factor this year: lack of renters. McCarthy, the Kinlin Grover executive, said operating income for the rental division of her agency, one of the Cape's largest, is up 18 percent through the first five months of the year over last year. Though there is discounting on some properties, generally the more expensive, higher-end homes are renting fast, Fritz said. One of her listings, a waterfront home on Cape Cod Bay near Orleans town center that rents for $2,700 a week, was booked solid back in January. Have you had luck this summer?